Are you a DJ or a home-user looking for the most efficient way to catalog your music collection? Music Label 2014 is the answer to your problems. - Get your whole collection organized in no time. Simply insert CDs or type titles and all information about your music will be instantly downloaded. - Find those golden oldies with the powerful yet easy-to-use search engine. - Save money by not purchasing duplicate CDs and by keeping track of CDs on loan. - Get the full picture of your collection with statistics and reports. - Catalog any kind of media ranging from CD and vinyl to MP3 files on your hard drive, or even cassettes if you still have those. You can even add your own media types, making Music Label future proof. - See your collection with whole new eyes and learn new things about your music by reading the downloaded information. - Export your collection and save it on your mobile device to carry it along at all times. Music Label exports to a variety of formats. 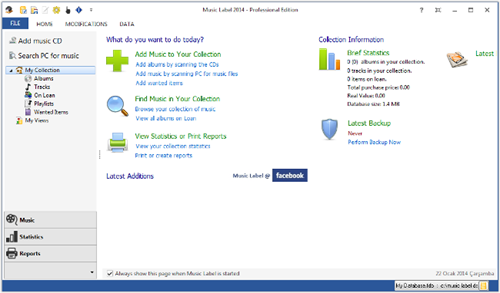 - Quickly get your music library organized by scanning CDs or typing the title. - Catalog any type of media (CD, vinyl, SACD, MP3, WMA, OGG, etc). - Keep track of CDs on loan with the built-in loan manager. - Search and sort your collection with one click. - Print reports and watch a variety of statistics. - Keep a list of wanted and ordered items. - Handle box sets with ease. - Create any number of databases of any size. - Lists: Tracks, Musicians, Studios, Companies, etc..
- Info: Artist, Title, Genre, Record Label, Release Year, Original Release Year, Website, etc..
- The above and more is downloaded. Apart from the downloaded information you can add a lot of info: Rating, Comments, Lyrics, Price, Condition, Location, etc..